/ Modified oct 26, 2015 10:03 a.m.
New Horizons captured this image of Pluto's glacial ice cap in July 2015. The first formal results of NASA’s New Horizons fly-by exploration of Pluto are out, revealing glaciers on the distant dwarf planet. Slushy slabs of mostly nitrogen ice scrape craters off the landscape, creating the bright heart-shaped region photographed by the New Horizons spacecraft in July, said Will Grundy, a co-investigator on the New Horizons mission at Northern Arizona University's Lowell Observatory in Flagstaff. The findings appeared in the journal Science in October. 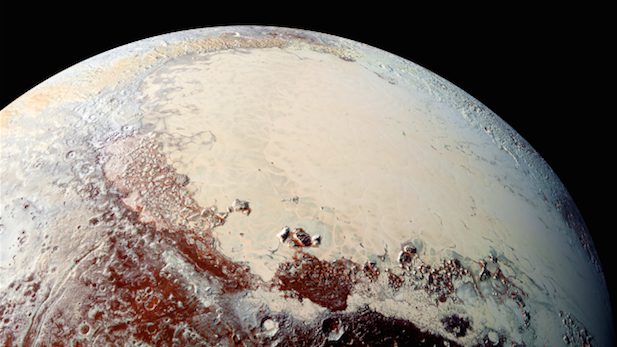 Grundy said it’s not clear how Pluto remains geologically active so long after its formation. He said it might be powered by an internal heat source that melts the glaciers just enough to get them moving. New Horizons also found rugged mountains rising from water-ice bedrock and dark streaks possibly formed by wind. Members of the science team speculated that more worlds like Pluto might exist out in the Kuiper Belt. The spacecraft just fired its thrusters to set a course for a Kuiper Belt object. The Arizona Science Desk is a collaboration of public broadcasting entities in the state, including Arizona Public Media.